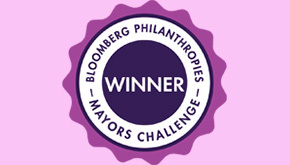 Mayor Angel Taveras joined today with New York City Mayor Michael Bloomberg to announce that the City of Providence is the grand prize winner in the Bloomberg Philanthropies’ Mayors Challenge, a competition to inspire American cities to generate innovative ideas that solve major challenges and improve city life – and that ultimately can be shared with other cities to improve the well-being of the nation. 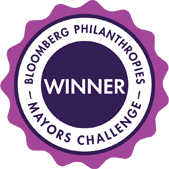 Providence was selected as a Mayors Challenge winner out of a pool of over 300 applicant cities, based on four criteria: vision, ability to implement, potential for impact, and potential for replication. Providence will be awarded a $5 million innovation prize to implement its idea to improve the vocabularies of preschool-age children throughout the City by measuring and rapidly increasing the number of words spoken in their households. Providence will also receive a sculpture created by world-renowned designer Olafur Eliasson to commemorate each of the Mayors Challenge winners. The real winner is whoever is selling the gizmos.